Whisk together sugar and flour. Slowly add water or cherry juice and whisk until smooth. Cook over medium heat until thickened, about 4-5 minutes. Add cherries and continue to cook for an additional 10 minutes. Remove from heat and add almond flavoring. Set aside to cool. Allow puff pastry to thaw in refrigerator. Unfold pastry and cut into 9 equal squares. Place pastry squares in muffin or tart tin. Mix cream cheese, powdered sugar and vanilla until smooth. Drop 1-2 tablespoons of cream cheese mixture into pastry cups. 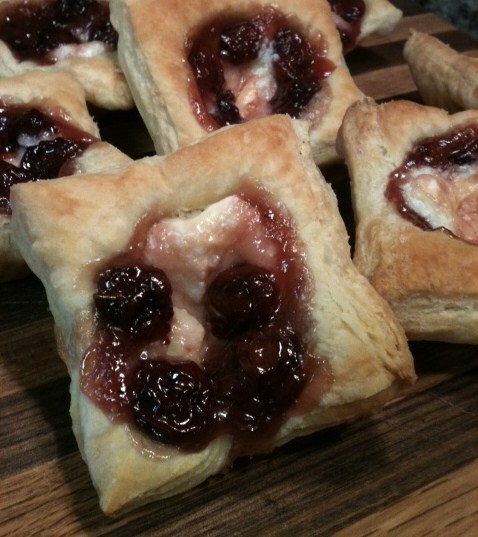 Cover cream cheese with cherry pie filling. Posted on January 2, 2012 by Karma in the Kitchen and filed under Desserts and tagged Desserts.